At the end of ’09, Capitec did a Youth Prosperity Survey to gauge how the SA youth sees their financial future. Cow was approached by Atmosphere (King James) and needed to create an online survey that appeals to a younger target audience while keeping them engaged enough to complete the survey. We decided to flip the concept of a survey on its head, creating an interactive quiz. Since the 18-24 target market is very active on mobile, we also extended the quiz in WAP format. 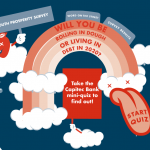 The mobile quiz had the same look and feel, as well as functionality making it possible for users to sign up to hear more from Capitec. If you’d like to take the quiz, feel free to hop on over to the Youth Prosperity Survey.